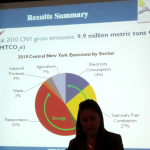 The CNY RPDB released the final DRAFT of the Vision CNY Regional Sustainability Plan on Monday June 10th, 2013. The plan document can be accessed on the CNY RPDB agency website (www.cnyrpdb.org). The document will be reviewed at the June 19th meeting of the CNY RPDB. The Central New York Regional Planning and Development Board (CNY RPDB) released the first DRAFT of the Vision CNY Regional Sustainability Plan on Tuesday February 14th 2013. The DRAFT plan document will be reviewed at the February 20th meeting of the CNY RPDB. The DRAFT document is available on the Plan Documents page of the visioncny.org website. Do you have ideas for the future of Central New York? What would make our region more sustainable? The Central New York Regional Planning and Development Board (CNY RPDB) is seeking public input in the development of the Vision CNY Regional Sustainability Plan. Project ideas should create opportunities for achieving carbon reductions, energy efficiency savings and/or renewable energy deployment while enhancing job creation, economic investment and development consistent with a region’s sustainability and REDC strategic plan. 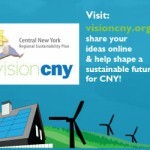 Welcome to the website for Vision CNY the Regional Sustainability Plan for Central New York. Work on this plan was initiated in June 2012 and is scheduled for completion by January 2013. We welcome your participation. 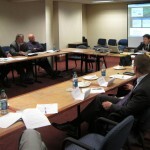 The Central New York Regional Planning and Development Board (CNY RPDB) has received funding from the New York State Energy Research and Development Authority (NYSERDA) to develop a regional plan for sustainable development to serve a five-county area in Central New York including the Counties of Cayuga, Cortland, Madison, Onondaga, and Oswego, through the New York State Cleaner, Greener Communities program. Do you live in Central New York? Click on the link above to take this short quiz and find out how much you know about the important issues and trends that are impacting our region. Have opinions on the future of Central New York? Click on the link above to take our poll and share your thoughts on key issues facing our region. Click on the link above and download the final DRAFT of the Vision CNY Regional Sustainability Plan and Appendices.